The Skinny: Before this movie, Stephen Chow was just a star. After this movie, he became a megastar who routinely beat out people like Chow Yun-Fat and Jackie Chan at the box-office. The movie's funny, too. This extremely popular comedy from Jeff Lau and Corey Yuen became the highest grossing film in HK history and launched the career of Hong Kong’s most loveable superstar. Thanks to his performance as a God of Gamblers wannabe, Stephen Chow became the biggest box office draw of the nineties. The plot of this wackfest concerns Sing (Chow), a dumb, lovable, and superpowered mainlander who comes to China to visit his uncle Tat (Ng Man-Tat). At first he only gets on Tat’s nerves, but when it’s revealed that he can see through objects, Tat gets some funky ideas. He employs Chow as “Do Sing,” or the “Saint of Gambling,” and proceeds to set him loose on the gambling world. Sing ends up making a ton of bucks at the gambling tables and attracts the attentions of two rival gamblers (Paul Chun and Jeff Lau). Sing falls in with Lau, but Chun does his best to make sure Sing won’t succeed in the “King of Gamblers” competition. 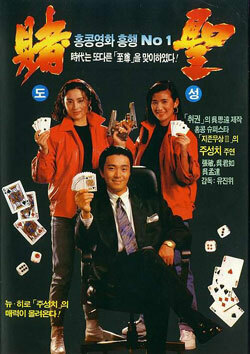 Meanwhile, Sing falls for Yee-Mong (Cheung Man), gangster moll and tough-as-nails double-agent. This film is uneven, featuring more untranslatable jokes than Chow’s next twelve films combined. Thankfully, Chow showed his superstar talent at this early stage; you can get by thanks to his hilarious delivery and winning physical comedy. The chemistry between Chow and Ng Man-Tat is evident even at this early stage in their partnership. A fun film.